4th Floor Gallery, Monday-Friday, 9:30 a.m. - 4:00 p.m. 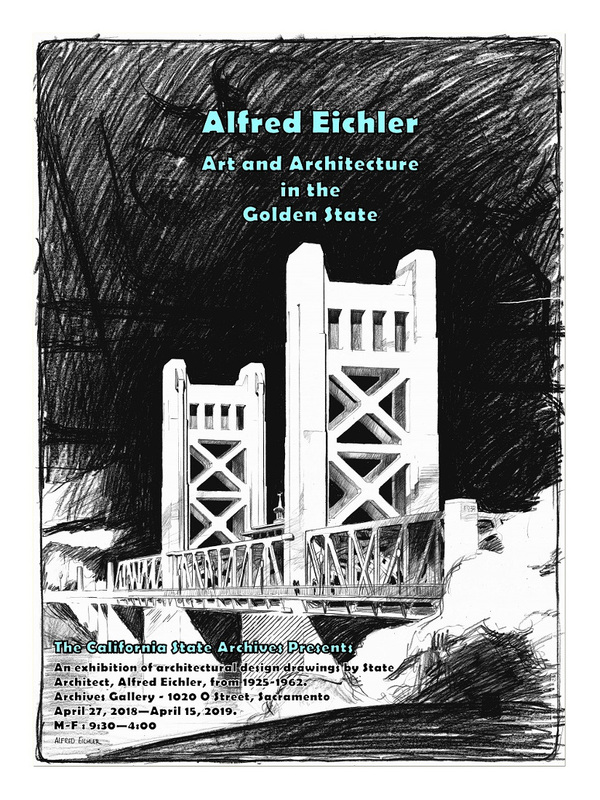 Architectural drawings and paintings presented in this exhibition are drawn from the Alfred Eichler Collection, within the Architecture Division of the Department of Public Works records housed at the California State Archives. Featured are public project designs created by Eichler from 1925 to 1962, such as San Quentin and Folsom Prisons, Sacramento’s Tower Bridge, state fairgrounds, Stockton and Napa state hospitals, School for the Deaf in Berkeley, state universities, Benicia State Capitol restoration, the Yountville Veterans Home, and others. Eichler utilized a variety of styles and art media to create these pieces. Each one is an example of the Golden State’s efforts to address the needs of a diverse and growing population through public projects. 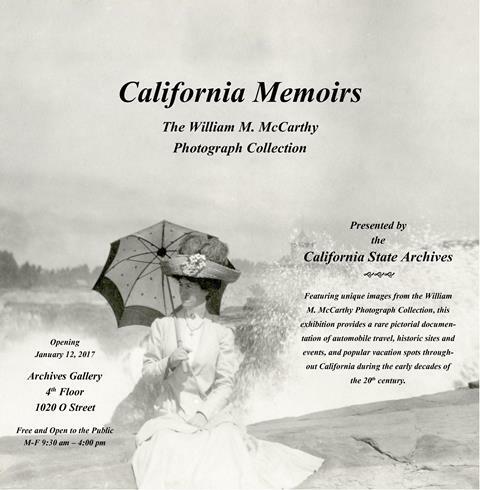 William and Grace McCarthy, native Californians born in the late-19th century, pursued their passion for both photography and travel for many years. 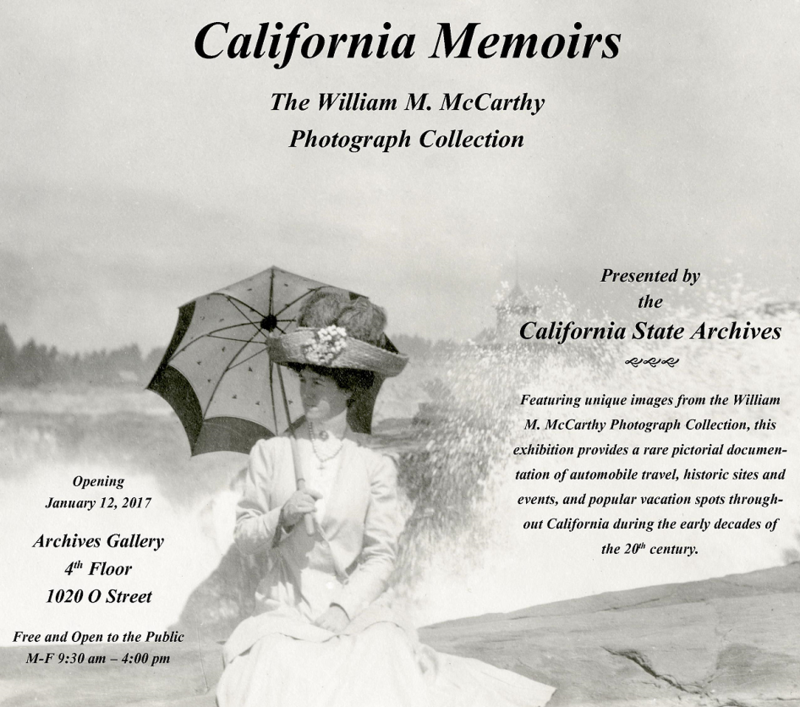 The end result is a collection of nearly 3,000 photographs mounted in eleven albums that provide rare pictorial documentation of the couple’s early-20th century travels through California and beyond. 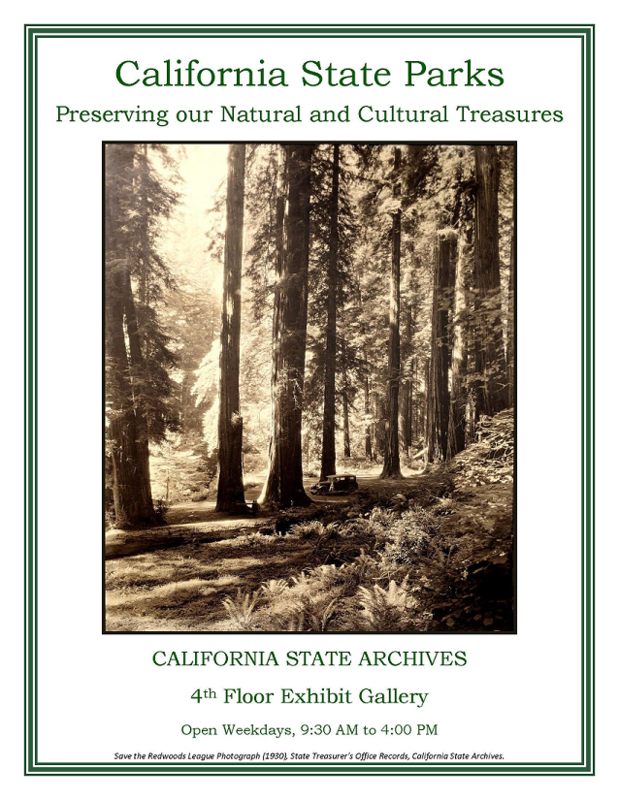 Featured photographs will emphasize California's diverse natural and built environments, historic sites, and family life. Always ready with the camera, William McCarthy also captured significant events that shaped or impacted the state's development, events such as stunning images of San Francisco before and after the 1906 earthquake, the fire that destroyed that city's iconic Cliff House in 1907, and the 1915 Panama Pacific International Exposition. Established in 1933 by Clem Whitaker and Leone Baxter, Campaigns, Inc. was the first political consulting and campaign management firm in the nation. Little known, they worked behind the scenes, pioneering the ideas and methods of public relations and the marketing of candidates and ballot measures. 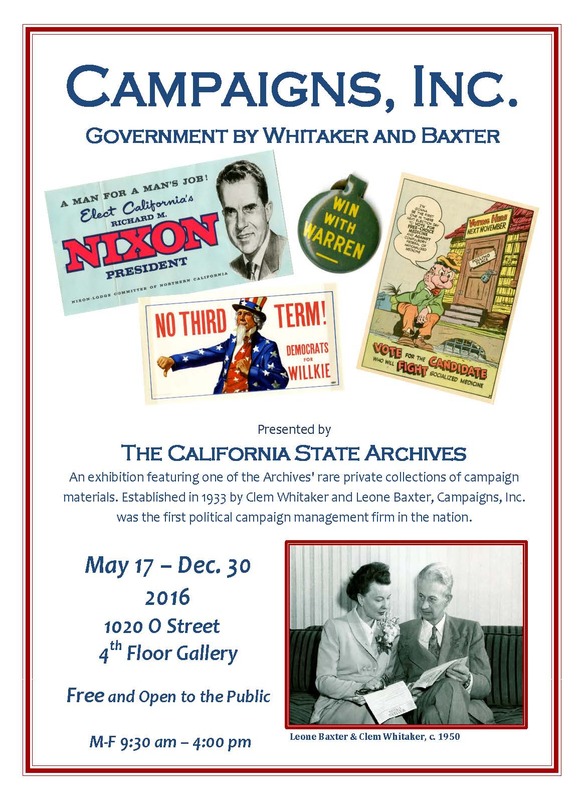 One of the rare private collections at the State Archives, the Whitaker and Baxter materials document and visually illustrate the state's political, social, economic, and cultural history, and the ways it was shaped by the workings and media manipulations of Whitaker and Baxter's Campaigns, Inc. The exhibit will highlight records that document the inner workings of the firm along with advertising materials created for political campaigns such as the presidential campaigns of Wendell Willkie in 1940, Richard Nixon in 1960, and the gubernatorial campaigns of Earl Warren and Goodwin Knight, as well as numerous state and local ballot measures. Also included will be the successful nation-wide public relations campaign for the American Medical Association against President Harry Truman's proposal for a national health care system in 1949. This exhibit highlighted the responsibilities of the Secretary of State, from the original functions outlined in the Statutes of 1850, Chapter 6 to the duties of the modern era. Some of the early tasks, such as elections monitoring, business filings, and receiving official acts of the Governor and Legislature remain today. During the early decades of statehood, the Secretary of State carried out the duties of the office with a staff of four; today, nearly 500 people handle the multitude of responsibilities assigned to the Secretary of State’s office. From the early foundations to today, the Office of the Secretary of State continues its dedication to making California history and government more transparent and accessible. The exhibit displayed original items highlighting the various divisions of the office, including the Archives, Business Entities, Elections, and Political Reform. In addition, the exhibit included information about long-serving secretaries who impacted the office in significant ways. Featured items included the 1849 election returns from Sutter's Fort, absentee ballots of Civil War soldiers stationed across the country, the 1933 Marx Brothers articles of incorporation, an 1884 bar of "The King of Soaps" for trademark registration, and an instruction model of an early 1960s automatic voting machine. The blueprint of the first vault built in the capitol basement to secure the state's historic documents was also on display. On June 30, 1864, President Abraham Lincoln signed the Yosemite Grant Act. This law marked the beginning of California’s efforts to conserve and protect natural resources for public enjoyment, as well as similar national efforts. By preserving the state’s diverse natural and cultural resources, California State Parks continues to provide opportunities for health, inspiration, education, and outdoor recreation. 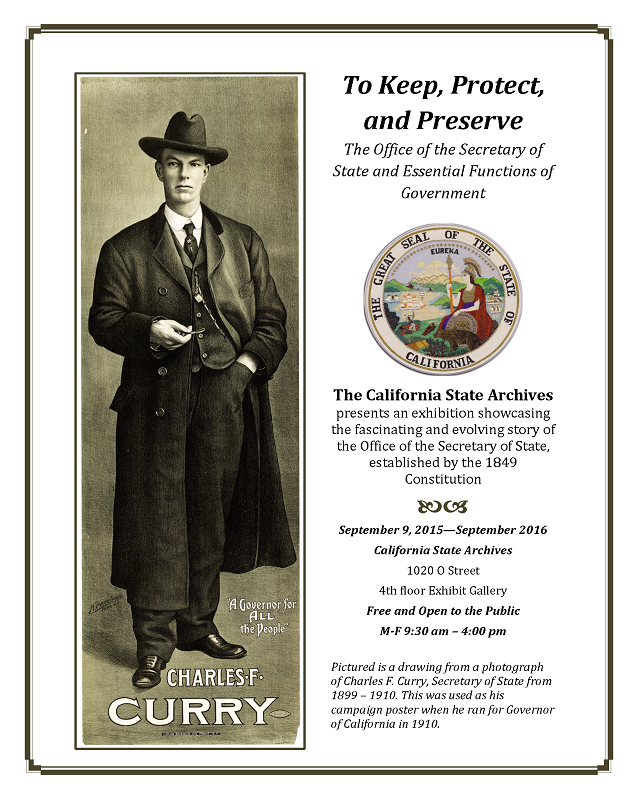 The exhibit storyline spanned the evolution of state parks in California from the first land grant to today’s 280 state parks, historic sites, and recreation areas. The exhibit covered Yosemite’s history as a state park; efforts of early conservationists; the creation of the state park system; historic preservation projects; the post-war boom and need for more recreational opportunities; and increased efforts to represent California’s diverse heritage, cultures, and natural environments through parks. 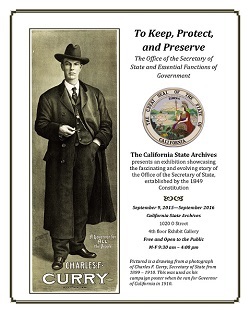 The exhibit showcased the Archives’ collections including records, architectural drawings, maps, postcards, and park ranger badges. Highlights included the 1864 proclamation signed by Governor Frederick Low; an 1892 signed letter from the first guardian of Yosemite with a hand-drawn map of the valley; color lithographs; and photographs of parks, historic preservation projects, and Civilian Conservation Corps camps. 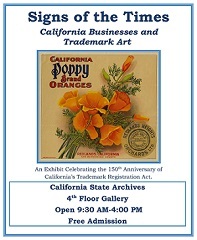 This exhibit celebrated the 150th anniversary of California's Trademark Registration Act (Chapter 129, Statutes of 1863) and focused on late 19th and early 20th century trademarks. It featured colorful fruit crate labels, clever cigar box labels, and trademarks depicting California state symbols such as grizzly bears, gold miners, and the Great Seal. Other items on exhibit included examples of court cases which further defined trademark law, patent medicine labels, and trademarks used by famous beverage and sweets companies. California began registering certain container brands in 1861, but trademark registration for all types of products began in 1863 (seven years prior to federal legislation). 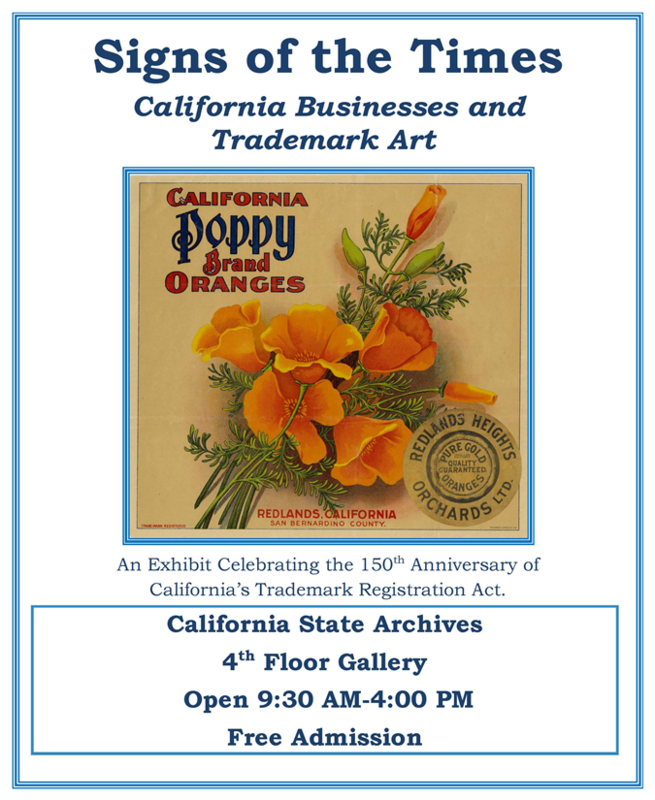 California was the first state in the Union to allow trademark registration, and today those doing business in California still register their trademarks with the Secretary of State. The State Archives preserves trademarks records (1861-1991) as part of the records of the Secretary of State's office. Coinciding with Veterans Day and the 25th anniversary of the California Vietnam Veterans Memorial in Sacramento's Capitol Park, the California Secretary of State's Archives Division mounted an exhibit of items placed at the Memorial. Mementos displayed included uniforms, hats, medals, patches, poems, posters, correspondence, and even a bullet-riddled helicopter blade. 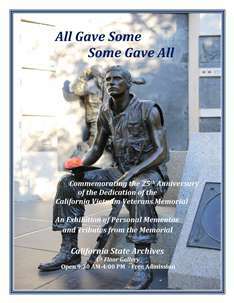 Since the Memorial’s opening in 1988, visitors have left more than 1,500 items of personal or historical significance at the site. Items left at the site are transferred to the State Archives. 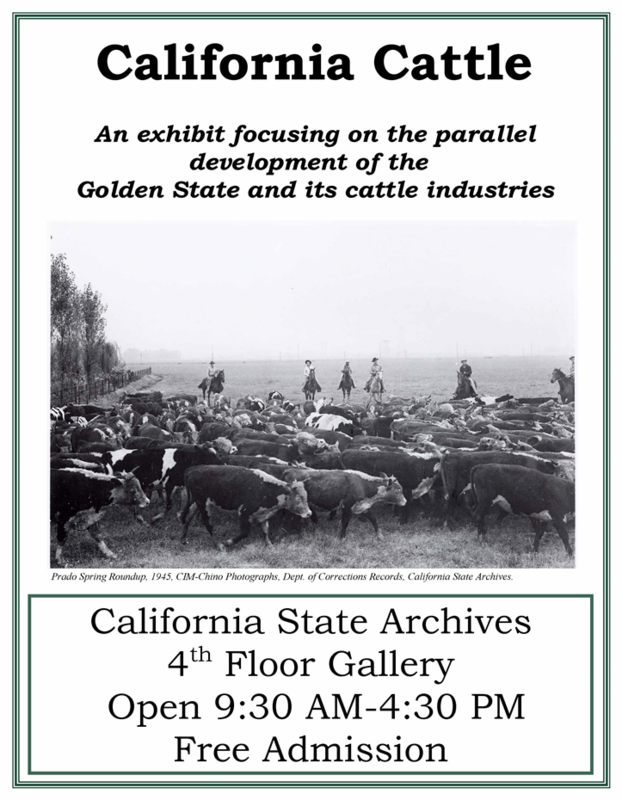 "California Cattle" focused on the parallel development of the Golden State and its cattle industries, showcased cattle-related records from the collections of the State Archives including Spanish and Mexican land grant maps, colorful product trademarks, and state agency photographs. 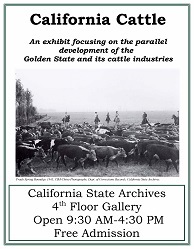 From the original herd brought to California by Spanish explorers to our state's current status as a leading beef and dairy producer, the exhibit touched on topics such as early California ranches, water rights, legislation regulating the dairy and beef industries, efforts to improve livestock health, the State Fair, and the prize-winning herds of state institutions. 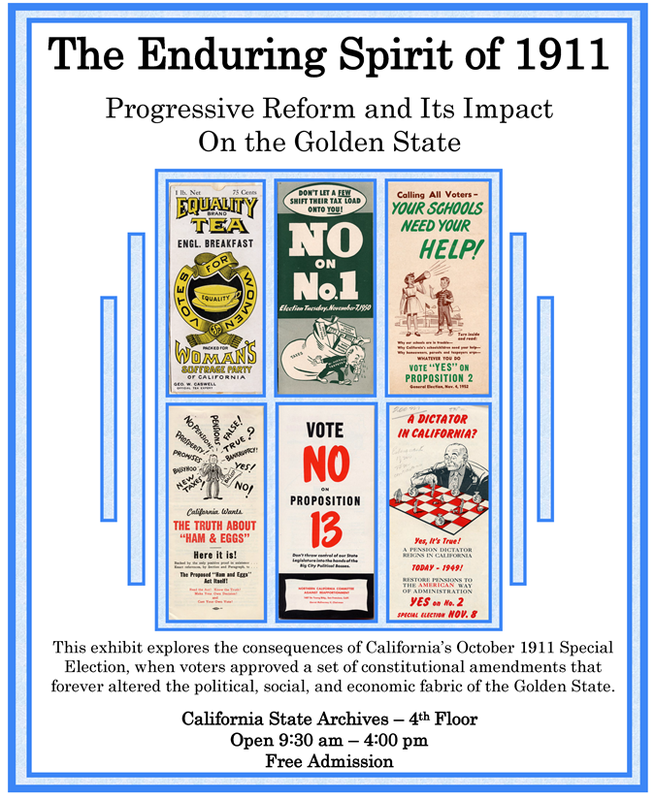 This exhibit explored the consequences of California's October 1911 Special Election. 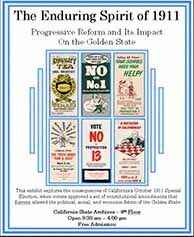 At that time, voters approved a set of constitutional amendments that forever altered the political, social, and economic fabric of the Golden State. One hundred years later, Californians are still living with the impact of the changes wrought by this pivotal election.